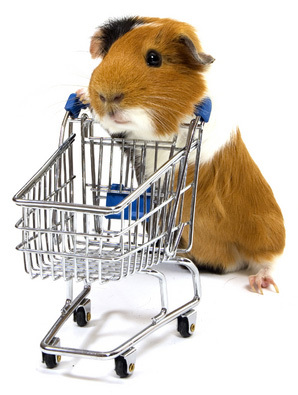 What do I need for my pet guinea pig? Now that you have decided on a guinea pig as your pet you should have the cage and all the supplies necessary before bringing him home. This care sheet will guide you in having everything you need. Remember, cavies are chewers so choose his home accordingly. You will need a cage with at least 2 square feet of space for each guinea pig being housed in it. Always go with the biggest cage possible for a happy pet. Do not use wire mesh for the cage flooring. A substrate or bedding for the bottom of the cage. Make sure you avoid wood shavings. A stoppered or ceramic water bowl. Remember you guinea pig will play in the bowl and soil the water so a bottle may be a better choice. A hay rack for hanging leafy greens, hay and grass to keep it clean and fresh. A few wooden chew sticks or blocks plus some toys. Your pet will love toys he can nibble on, climb over, push around and bump with his nose. A hide area for your pet to spend private time resting and feeling secure. A commercial brand guinea pig food. Hay and leafy green vegetables for your guinea pig to nibble on. Treats to add variety to your pets diet.